Follow Becky Sinn on Facebook! Dr. Sinn’s Mama is the sweetest little southern belle you could ever meet. She was a nurse’s assistant and has helped people all over Florida. Later in her career she was a private duty nurse and Dr. Sinn, from a very early age, helped her mama care for those who could not care for themselves. Both her parents cultivated in her a love and knowledge of all things antique and vintage (including people and music.) Her daddy was a legend of a man. He was a strong and silent cowboy type and yet was a hilarious person. He was a junk man and the litter control supervisor for Marion county for many years. He would bring home old phonographs, collections of antique costume jewelry and other treasures from forgotten times that people had carelessly discarded, thus making Dr. Sinn a formidable junk lady. Her mother and father were both musical and encouraged every creative impulse she ever had. They never hesitated to put musical instruments in her hands. As soon as she was tall enough to pick it up, her father always let her hold and play with his vintage Cortez acoustic guitar. Eventually, a 13 year old Dr. Sinn was “obsessed with Nirvana” and had to learn guitar. Her daddy taught her first chords to her and Mr. Cobain taught her lots more after that, then she started writing original songs. Her older brother Micheal bought her her first cds which included Beethoven, Tchaikovsky, Gershwin. He also fostered a love of Weird Al, Star Wars, Indiana Jones, Back to the Future and Ghostbusters. Her brother Mack has always been her rock. He has been there in the best and worst of times and even beat people up if they ever said a cross word about his sister. He pushed her hardest to pursue her music and also taught her how to throw a punch that will make your ears ring. Many moons later, Dr. Sinn has an album of original music entitled Myne Owne, dedicated to her brother Mack, that was released in 2012 and another album’s wort waiting to be recorded. Her daddy has long since passed, but she vowed to him that she would use her talents to make a mark in this world and make people happy. Mama Sinn, incredibly and shockingly, due to extreme financial and emotional duress, became a bank robber in her twilight years. The good Dr. and her family visit mama regularly and hope she will return home soon. 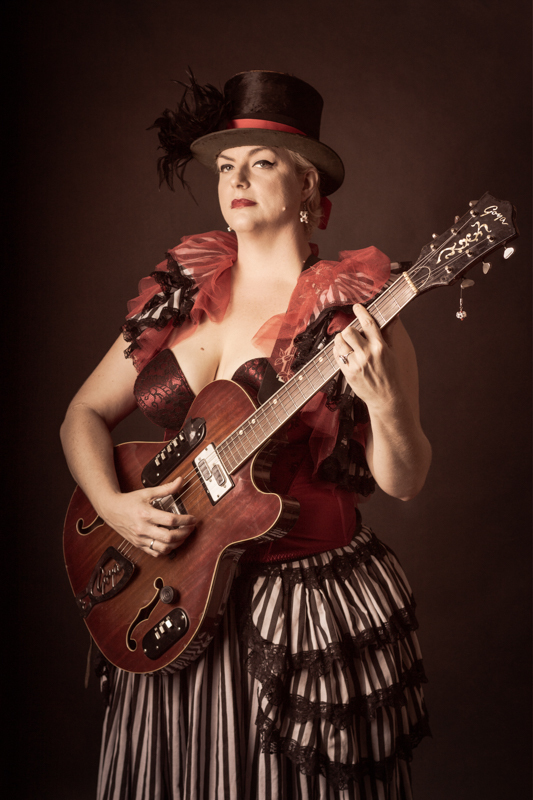 Dr. Sinn marches on with her guitar in hand and massive lungs filled with song in an attempt to spread joy, laughter and wonder in this insane world and found unmatched inspiration and much needed camaraderie and love in a band of misfit clowns.